Trinity Mirror is proposing to move MEN Media staff from their Manchester base to Oldham, as part of its acquisition of the business from Guardian Media Group (GMG). GMG today confirmed the sale of its regional media business to Trinity for a total consideration of £44.8 million, ending long-running speculation about discussions between the two publishers. Trinity Mirror will acquire the 32 newspapers and associated websites which operate under GMG's MEN Media in the north west, including the Manchester Evening News, and S&B Media in the south of England. The transaction is expected to complete on 28 March. The businesses made no operating profit in the 12 months to December 2009 and have gross assets of £8.7 million, according to a statement from Trinity Mirror. In addition £37.4 million of the deal is being paid by Trinity to release GMG from a long-term printing contract. Channel M, the much beleaguered TV station that operates out of the MEN newsroom, and GMG's local papers in Woking will not be part of the deal, a release from GMG says. A separate buyer is being sought for the Woking titles, according to reports. Chief executive Carolyn McCall briefed staff at MEN Media this morning on Trinity Mirror's proposals to move staff to its Oldham premises, which will be discussed over the next six weeks with staff, a spokesman for GMG confirmed to Journalism.co.uk. A Trinity Mirror spokesman said: "Due to the lease requirements Trinity Mirror has only been granted a six-month licence for the occupation of Scott place. Therefore we are required to relocate operations and it is proposed to relocate to Trinity Mirror's Greater Manchester premises in Oldham." Printing for MEN Media's newspapers is currently based in Oldham in a shared operation with Trinity Mirror's Liverpool papers, but there is no editorial base for staff there. National Union of Journalists (NUJ) northern organiser Chris Morley said the proposals to move staff was another blow for MEN Media journalists, in particular staff on weekly titles, who only last year were relocated to the Manchester newsroom. As part of the sale, which is expected to complete by 28 March, Mark Dodson, chief executive of GMG Regional Media, will leave the company, as will Ruth Spratt, current managing director of MEN Media, who will be replaced by David Sharrock, current chief operating officer of GMG Regional Media. The sale also severs the Guardian's ties with Manchester and the origins of its national newspaper, which first appeared as the Manchester Guardian on 5 May 1821. "The Manchester Evening News and its sister titles have made a huge contribution to the fortunes of the Group for the best part of a century. GMG would like to pay tribute to all the staff for their hard work and achievement in a sector dealing with structural change as well as economic downturn," says Carolyn McCall, chief executive of GMG, in a press statement. "GMG is mandated to secure the future of the Guardian in perpetuity, and we have a strong portfolio which has to be in the right shape to achieve that goal. The Group board and the Scott Trust have made the decision to sell in light of these strategic objectives." Speaking to Journalism.co.uk, a former Manchester Evening News employee, said the paper had been "sold down the river by The Guardian". In March last year GMG said its decision to cut 78 journalists from its regional media division was to protect "the business and its journalism for the future". "The need to divert hundreds of millions of pounds of its profits over the decades to prop up the loss-making Guardian has weighed heavily on the MEN," the former MEN staff member said. "Now, in the first year the MEN makes a loss, that loyalty has been repaid with a near instant sale as the Scott Trust terms dictate that nothing can threaten the survival of The Guardian. The MEN is one of our great regional newspapers and has a brand well placed to succeed in the digital age if Trinity Mirror gives it the resources to do the job properly." Morley said the NUJ was well represented within the newsrooms affected by the sale and would work to protect the working conditions and jobs currently held by staff. But Morley said the union was concerned that Trinity Mirror would not make the investment required to support the loss-making papers published by MEN Media, because of its track record for managing other regional news groups. Craig McGill from digital communications company Contently Managed, who worked at Trinity Mirror - at the Sunday Mirror and Daily Mirror from 2000 to 2006 - and has freelanced for the Guardian, shared concerns that GMG had sacrificed its regional news business to protect the Guardian. "The Guardian is the very title that tells us constantly - almost as much as it goes on about The Wire in fact - that local content is what people want, it's the future, it's the killer app that will keep people looking for news," McGill told Journalism.co.uk. "If that's the case why are they dumping all their local content creators? Or are they admitting that instead of highly paid professionals, a couple of bloggers can do the job instead? Or do they just want to be London-centric with a stringer or two elsewhere? That's hardly inspiring in an age of devolution to Scotland, Wales and Northern Ireland. What should readers in those areas do? Go elsewhere?" McGill also questioned Trinity Mirror's motives for the purchase and its investment record: "To add to that, Trinity Mirror has a record of poor investment in the regions - it chopped the Scottish Daily Mirror from a team of 30 to one over three years, the Daily Record and Sunday Mail titles work wonders with a small budget but are walloped by having to do more with less each year, which lead to the Scottish Sun overtaking them as the best selling daily in Scotland. "This buy smacks of a panic buy - almost as much as it was a much-needed sale for GMG. Who are the losers going to be? The obvious one is the people who have already lost their jobs - more will follow, we can be sure of that. Over time the readers will be losers too as there's less journalistic competition bringing more stories." "The move by Trinity Mirror has implications for the future ownership of local media across the UK, as major publishers weigh up their chances of swallowing up what remains of independent publishing in Britain," says Michelle Stanistreet, NUJ deputy general secretary, in a release from the union. "The concerns for diversity of information and media in the north west are an immediate concern which we will be raising with the Department of Business Innovation and Skills. Trinity Mirror already publishes the Liverpool Post and Echo titles, in addition to a substantial stable of weekly papers across Cheshire and Merseyside. 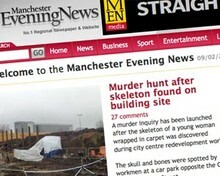 Now it will also control the prestigious Manchester Evening News, which has a series of titles in the region. This all raises issues of editorial independence which should be of concern to government and community leaders as well as the media industry." But speaking to Journalism.co.uk, Francois Pierre Nel, from the journalism department at the University of Central Lancashire (UCLAN), said the sale would be positive for the Manchester area at least. "The MEN has been in decline for years, which the company's leadership have attempted to arrest through a number of bold moves, such as the MEN's part-paid, part-free distribution strategy and the launch of Channel M, which haven't delivered. As the management guru Kenichi Ohmae says, 'Rowing harder doesn't help if the boat is headed in the wrong direction'," said Nel. "It's clearly time for the business to chart a new course. In doing so, TM Regional's Georgina Harvey and Neil Benson will have to navigate some tricky territory. The MEN's weakness has given niche competitors, such as Crain's Manchester Business, TheBusinessDesk.co.uk, How-Do and Manchester Confidential, the space to establish themselves." Last month former GMG weekly editorial chief Richard Catlow announced the launch of a new series of newspapers for the area, which Nel said he could see the Guardian's own local "beatblogging" experiment expanding to Manchester if it is successful in its pilot areas of Leeds, Edinburgh and Cardiff.